With many outfits, you simply fix your bra straps so they don't show. Certain shirts and dresses, though, especially those with thin straps, are hard to wear without showing the bra straps. The answer to this problem involves adding a shelf bra to your garment. This may seem like a difficult process, but it is one you can do in an afternoon. Add a shelf bra to your camisoles and T-shirts if necessary. Trace the front, back and sides of the top of your garment using pencil and paper. Add between 2 and 4 inches to the sides, to cover the area of your bust; the larger your bust, the more space you add to the side seams. Measure the bust area from where the top of the garment starts to the bottom of where your regular bra band sits. Draw a straight line on the paper with this measurement; this gives you the length you need. Cut your fabric out using the pattern. Pin the pattern together and check that it fits snugly against your bust. 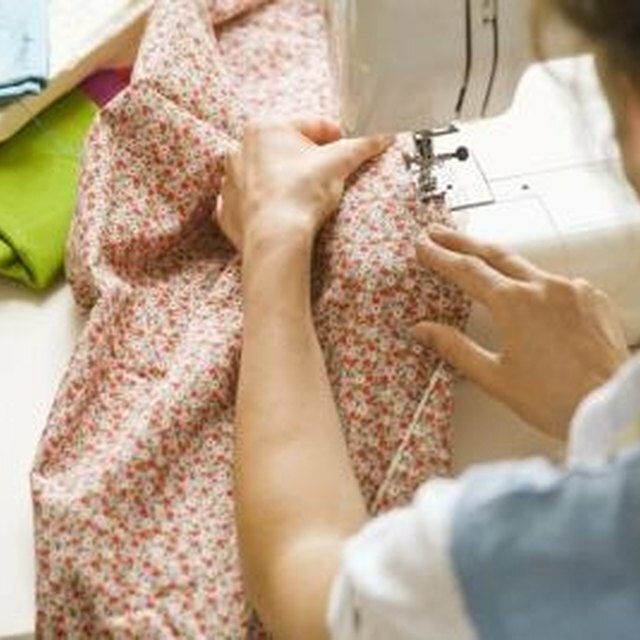 Cut along the side seams of your garment 2 inches below where you plan to add the shelf bra. Measure your ribcage just under your bust and divide the number in half. Measure the elastic to this amount and cut it. Use your sewing machine to sew the elastic directly onto the bottom of your shelf bra. Sew the sides and top of the shelf bra into the garment. Resew the sides of the garment together, holding the shelf bra in place. Use a fabric that closely matches your current garment, so the shelf bra won't show through.